Last year Amelia dressed as Amelia Dearheart for her first Halloween. It was kinda epic, If I say so myself, so I'm feeling pressure to come up with something cool for this year. Well, I finally thought of this year's Halloween costume and here's a sneak peak. I've had this bag of beans in my cupboard for 2 years. My sister bought it to make bean soup while visiting from Seattle. Suffice it to say, now that she's not here, this is the only way these beans will get cooked. Beans become the pie filling to give it weight. Pretend they're strawberries. 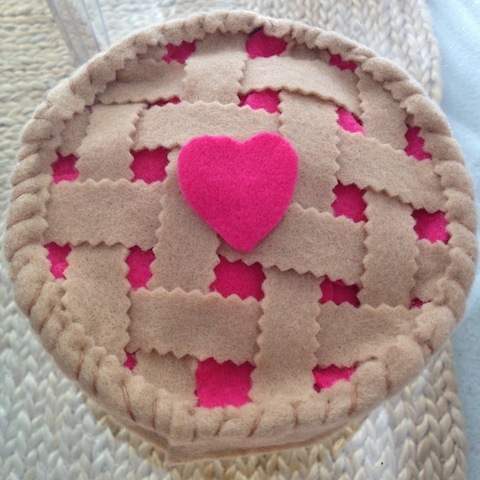 The felt pie is covered and spill-proofed. Strawberry slices are layered on top. The pie crust is woven. The crust is sewn on by hand. Tada! The strawberry pie is baked and ready for trick or treating...It's totally normal that I'm not allowing my child to play with this until Halloween, right?